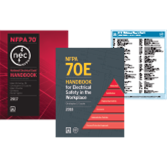 2017 NEC and 2018 NFPA 70E Handbooks Toolkit - Exclusive from NFPA! Get the NEC and NFPA 70E straight from the source and save with our exclusive Toolkit Bundle, a $356 value for only $292.50. Make sure you're up-to-date with the latest changes to the 2017 NFPA 70®, National Electrical Code® (NEC®) and 2018 NFPA 70E®, Standard for Electrical Safety in the Workplace®. The NEC and NFPA 70E are trusted compliance documents that help you stay electrically safe in commercial, residential, and industrial work. All you need to know about the National Electrical Code&reg and NFPA 70E, from the people who know all about them! Order this valuable NEC and NFPA 70E Handbooks Toolkit today!